In particular, we welcomed two visitors from the European makerspace movement VULCA, Alexandre (on the left) and his colleague Clemence (second from the right). The visitors met with our trustees and filled us in how makerspaces were growing across Europe. 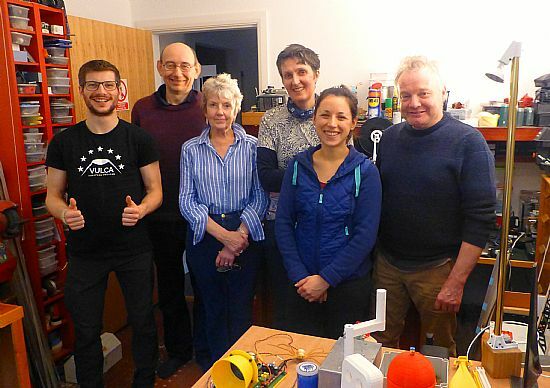 The Vulca Makers Mobility Program had over 100 volunteers from European makers pace who had collectively visited over 250 makerspaces in Europe. We were informed about an earlier European Commission study that had visited 28 countries and generated a report Available here. A map extracted from this report is reproduced below. It was interesting to see that for the four major countries in the EU this study had recorded the following numbers of makerspaces: France 158, Germany 151, Italy 133, the UK 57. 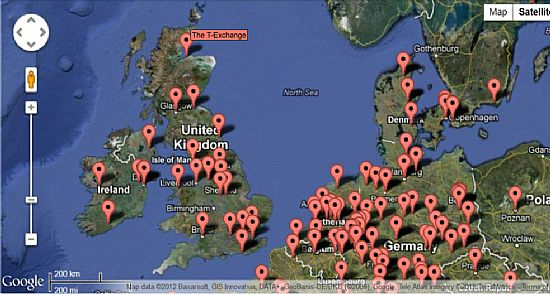 The UK numbers included The T-Exchange and 3 others in Scotland. The number for the Netherlands was 54; just about the same as for the whole UK. on Friday 1st March 2019 at 10:00 am. Would discussion with like or even unlike minds help you to make stuff ? Would you be prepared to exchange your own skills with others ? Are you green or ANY other colour? Makerspaces and hackerspaces for the likes of us are being formed around the world.